Prayer cards are small cards, about the size of playing cards or smaller, passed out to individuals. They are often given out at memorial services, funerals, and other religious events. They are commonly passed out during Catholic services. But, they can be used in other denominations as well. Cards are typically produced in sheets. Each sheet can contain a single scripture or a variety of different scriptures, given out for different events. Churches, Funeral Homes, and clergy often order prayer cards based on the type of ceremony or event they will be given out at. For a baptism, the cards will include scripture related to baptism, for example. For a memorial service or funeral, prayer cards will often contain a favorite scripture of the deceased. A variation will contain the deceased person’s favorite scripture on one side and a related scripture on the other. The cards may contain a related scripture on one side and a summary of the individual’s life on the other. This is often done for people who have been active in their church or community. It serves as a way to highlight the individual’s contributions to society. It helps family and friends attending the memorial remember the person in a special way. Prayer cards are typically laminated, to keep them in good condition for years to come. As mementos at special events, they are often taken home and placed in photo albums or in scrap books. They serve as a way to remember the positive traits of a loved one who has passed. For many people, the cards can be a source of comfort and a way to come to terms with the loved one’s passing. The scriptures printed on at least one side are carefully selected for the occasion. 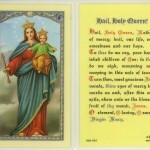 Cards are often printed in advance, by churches, funeral homes, and religious organizations. However, they can also be designed and ordered by individuals, for special occasions. Some couples like to give them to wedding guests. Some will select and order cards for attendees at a Baptism, First Communion, or other church sacrament. As long as the printed text is in good taste, many churches will allow couples or individuals to order their own. Some people like to plan their funerals or memorial services long before death. This can be a way of eliminating the small details of planning or scheduling services, for the loved ones left behind. Those who want to plan their own memorials, down to the last detail, can select their favorite scriptures and design their own prayer cards. Many people are becoming more involved in planning their own services, before they die. 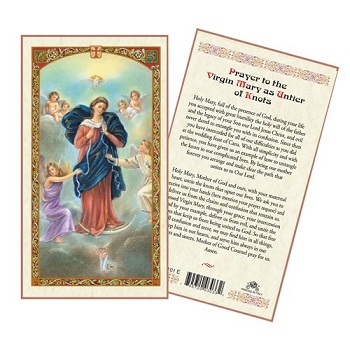 There are religious stores and online stores to order as many cards as desired. 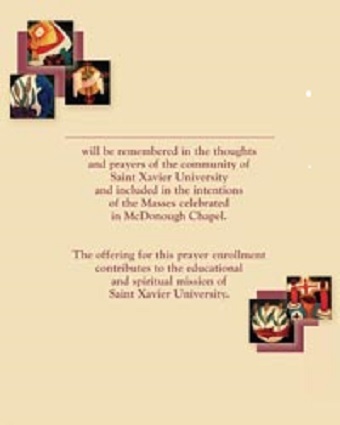 Prayer cards seem like small details, when it comes to special religious events. However, for those who attend, they can serve as uplifting mementos to take home. Scriptures applicable to the situation or related to the individual’s life serve as reminders of spiritual lives. They are customizable and should be selected with care. Prayer is not seen as a zero-sum game; God is not limited to answering so many prayers a day, and there is no limit to the number of people that can pray each day. However, sometimes people think that certain issues need more attention than others, either in hopes that more attention to the problem will increase the odds of it being answered. Because of this some organizations have created prayer circles, where the organization as a whole prays for some specific effect. In order to facilitate this they have prayer enrollment cards, both to find out what those prayers are as well as to gather those that will help pray for them. Each organization has a different way of disseminating these cards as well as using them. Some churches have card simply available in the vestibule; petitioners fill out the card and then return them to a box. 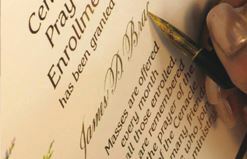 The body of the church will then add a special prayer directed to the granting of those prayers, asking that they as a group be answered without worrying about the specifics of the requested prayers. In some cases, the pastor may determine that certain prayers need special attention, and so will somehow mention these requests to the congregation as a whole, either mentioning them directly in the sermon or as part of the church bulletin. Other churches have a group of people, usually women, that will take the prayer cards and pray for the specific requests individually rather than as a single group. This individual prayer is sometimes referred to as “cenacle prayers”, after the room where Jesus and his disciples stayed and held the Last Supper, and is not always linked to a specific church. Either approach works: The blanket prayer works by allowing the petitioner to give up his request to God and puts it directly in His hands. Cenacle prayer makes the petitioner feel better as they know that someone will pray specifically for the supplicant. When it comes to collecting prayer enrollment cards, a number of different methods are in use. The traditional manner is to have the cards dispersed during the service as well as being available in some sort of receptacle; these cards are either collected at the end of the service or are tossed into a box or other receptacle. Prayer cards can also be mailed to a central address; a number of non-denominational groups do that as well. Electronic means are also possible; some cenacle prayer sites collect the information through an electronic form that is e-mailed to the organization collecting them. Through this methods the prayers are collected and then given to those that do the praying. This is a service that is usually provided by volunteers. Although some organizations do suggest a small donation in order to help cover administration costs, in most cases the service is totally free. However, the service provided is well worth any price, as the supplicant is given some solace: By taking on the prayer, the worry is lessened on the part of the supplicant as the issue is given up to a higher power, and the supplicant is better able to deal with the issue in his personal life. This is not because they have stopped worrying about it, but rather because they are no longer responsible for it, and that shift gives them added clarity when it comes to dealing with it. It may seem like a small favor, but it is a form of therapy that works. At least, it helps the person move on, and that makes it well worth it. It is never easy to plan a funeral for a loved family member or friend. The burden of grief combined with choosing funeral programs and memorial prayer cards can be overwhelming. A lot of people find that it can be very difficult to choose the right words for memorial programs. 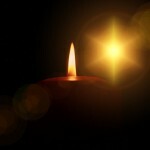 Companies that offer funeral programs and memorial prayer cards can be a huge help in this process. Each client can choose from numerous poems and prayers that can be paired with beautiful designs and colors when designing funeral programs and prayer cards. 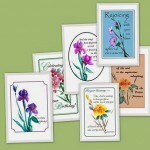 Funeral programs and memorial prayer cards are a sort of last tribute as well as a precious keepsake. One way to create these programs is to choose poems, biblical versus, and words that best describe the life that was. With several options available the task of creating these items is far easier and can be done rather quickly. The most popular poems and prayers used for memorial services are emotionally touching and perfect for both genders. If wanting a design or item that is not available through a funeral home, there are several online companies that offer memorial printing services. Before ordering memorial cards and funeral programs online, it is wise to check the reputation of the service provider. This ensures that the items will be printed and delivered on time. Most of these services have many more options than what might be offered through a funeral home. Regardless of personality and beliefs, there are funeral programs and prayer cards that will perfectly express any individuals life. Each funeral service program has a template that makes it easier to design them. This enables family members to select what they want placed on the program, and where they want it placed. Besides funeral programs and memorial prayer cards, many of these service providers also offer other funeral related items such as bookmarks and Thank You notes. All of these items are fully customizable and available in different languages. Some items are available for specific cultures, such as Irish blessings and prayers that cover a multitude of religious beliefs. If unable to find versus or poems that suite the person they are for, there is always the option of writing and uploading words that are more suitable. Most memorial service program providers also offer special poems and tributes for members of the military. These military related tributes are a perfect way to thank a soldier for their faithful service and sacrifices. Additionally, many printing services also offer assistance with creating obituaries and other memorial tributes. Though selecting these items may be emotionally difficult, the ability to create customized memorial items helps to make the service far more personalized. Uploading a picture into a funeral program template, or placing one on other items can be the perfect final touch to connect the words to the person. It is always hard to lose a loved one, but paying final respects by creating beautiful tributes makes the situation special to all who attend the services.